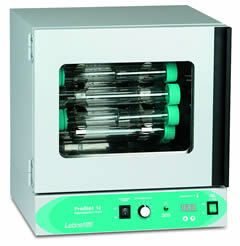 Hybridization ovens are the preferred technique for hybridization in today's laboratory. Incubations take place inside the oven, under constant rotation, providing even distribution of probe solution over the membrane. While there are other solutions available for hybridization applications, hybridization ovens offer better agitation, higher through put, and require less volume per membrane area, resulting in savings for your lab.. The 0 – 15 RPM range permits hybridization and washing at different speeds of rotation at the touch of a dial. A jogging switch is included to allow you to incrementally rotate the carousel for easy loading and unloading. These double walled units have outer chamber of M.S. sheet duly painted and inner of S.S. Temperature range from 5°C above ambient to 90°C is controlled through a PI Digital Temperature Controller with an accuracy of + 0.5°C. An air circulation fan is also provided to ensure temperature uniformity. A carrier to hold bottles (6 in number of size 60 m.m.dia x 200 m.m. depth) can be easily place on the rotor. The carrier rotates at a variable speed of 2 to 16 r.p.m. Viewing glass window in the door allows inspection of the specimen inside the chamber. To work on 220/230 volts A.C.
1. Accurate temperature control for improved experimental results. 2. Multiple rotisserie fittings for flexible choice of consumable. 3. Interchangeable rotisserie/shaking platform for hybridization and washing procedures. 4. Stackable format allows better utilization of laboratory space. 5. Variable speed settings for protocol optimization. 6.	two medium bottles, one bottle gripper, one mesh and hybridization guide (222060). 7. Stainless-steel rotisserie, 35mm clips, 10-bottle capacity.